Super Hot – 15% Off on All Refurbished Canon Camera, Lenses at Canon Direct Store ! 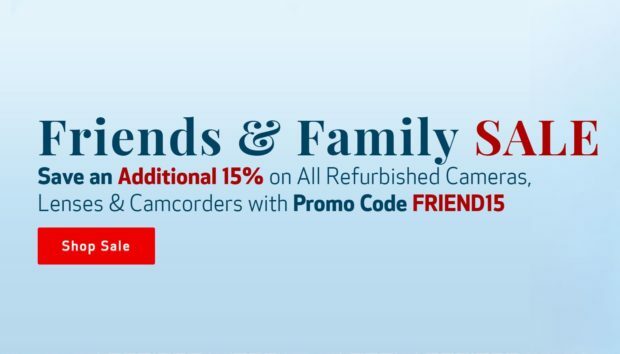 Canon USA direct store has satarted a super hot “Friends & Family Sale” on all refurbished Canon cameras, lenses, camcorders and more. You can save 15% off all these refurbished products by use promo code “FRIEND15” at checkout. All Canon refurbished products coming with 1-year Canon USA warranty. Most of refurbished items are lowest price online ever. Order ASAP before sold out. 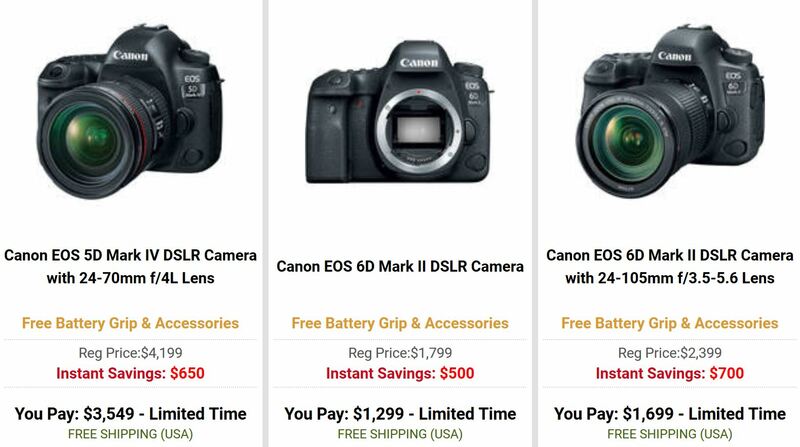 Author adminPosted on March 21, 2019 March 21, 2019 Categories Canon Deals, Canon EOS 5D Mark IV, Canon EOS 6D Mark II Deals & Used & Refurbished Deals, Canon LensesTags Refurbished DealsLeave a comment on Super Hot – 15% Off on All Refurbished Canon Camera, Lenses at Canon Direct Store ! Super Black Friday Deals ! 5D Mark IV Printer Bundle for $2,449 AR , 6D Mark II Printer Bundle for $949 AR at B&H & Adorama ! Update 2: Deals are expired ! Update: B&H has matched these deals ! Super Hot ! The real Black Friday deals for Canon EOS 5D Mark IV and Canon EOS 6D Mark II is here. Adorama Camera currently has Canon EOS 5D Mark IV Body with Printer + Accessories Bundles for $2,449 after $350 mail-in rebates, and Canon EOS 6D Mark II Body with Printer + Accessories Bundles for $949 after $350 mail-in rebates. This is the hottest deal online ever, order ASAP before sold out ! This deal will be expired tomorrow midnight ! Author adminPosted on November 21, 2018 November 22, 2018 Categories Canon EOS 5D Mark IV, Canon EOS 6D Mark II Deals & Used & Refurbished DealsTags Black Friday & Cyber MondayLeave a comment on Super Black Friday Deals ! 5D Mark IV Printer Bundle for $2,449 AR , 6D Mark II Printer Bundle for $949 AR at B&H & Adorama ! Canon Black Friday Deals now Live: 5D Mark IV $2,799, 6D Mark II $1,299, 100-400L IS II $1,799 and More ! Author adminPosted on November 18, 2018 November 20, 2018 Categories Canon Deals, Canon EOS 5D Mark IV, Canon EOS 6D Mark II Deals & Used & Refurbished Deals, Canon LensesTags Black Friday & Cyber Monday, EF 16-35mm f/2.8L III USM LensLeave a comment on Canon Black Friday Deals now Live: 5D Mark IV $2,799, 6D Mark II $1,299, 100-400L IS II $1,799 and More ! Canon Black Friday Deals Leaked: New Lowest Price for 5D Mark IV, 6D Mark II and Lenses ! Author adminPosted on November 17, 2018 Categories Canon EOS 5D Mark IV, Canon EOS 6D Mark II Deals & Used & Refurbished Deals, Canon LensesTags Black Friday & Cyber Monday, EF 16-35mm f/2.8L III USM LensLeave a comment on Canon Black Friday Deals Leaked: New Lowest Price for 5D Mark IV, 6D Mark II and Lenses ! Super Hot 20% Rakuten Points ! 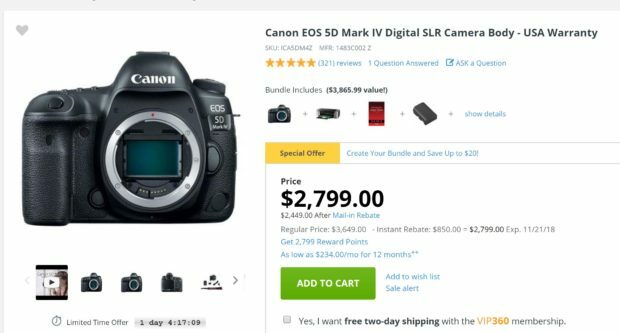 – 5D Mark IV for $2,479, 6D Mark II for $1,279 and More ! The very hot sitewide promotion on 20% back Rakuten Points for next orders now back again. Today only, ends on 10/29/18 at 11:59PM PT. Here are some great recommedations: Canon EOS 5D Mark IV body for $2,480 after $619 Rakuten points, 6D Mark II body for $1,279 after $319 Rakuten points, or EF 70-200mm f/2.8L IS III USM lens for $1,679 after $419 Rakuten points and more. All these items are with Canon USA warranty. Author adminPosted on October 30, 2018 October 30, 2018 Categories Canon EOS 5D Mark IV, Canon EOS 6D Mark II Deals & Used & Refurbished Deals, Canon EOS-1D X Mark IITags RakutenLeave a comment on Super Hot 20% Rakuten Points ! – 5D Mark IV for $2,479, 6D Mark II for $1,279 and More ! Woot ! (An Amazon Company) has super hot deals on new Canon EOS 5D Mark IV body w/ 24-105mm f/4L IS II lens kit for $2,379 (Regular price is $3,999 at B&H/Adorama), and 6D Mark II body for $1,199 (Regular price is $1,599 at B&H/Adorama). Coming with 1-Year Canon USA warranty. Lowest price online ever ! These are even better than last year’s Black Friday deals. End Tonight – EOS R Body for $1,839, w/ 24-105 for $2,719, 5D Mark IV for $2,479 and More After 20% Rakuten Points ! The Rakuten super hot deal aree still live. It is now only 6 hours left for the very hot sitewide promotion on 20% back Rakuten Points for next orders. Here are some great recommedations: Canon EOS R body for $1,839 after $459 rakuten points, w/ 24-105mm Lens kit for $2,719 after $679 rakuten points, or EOS 5D Mark IV body for $2,480 after $619 Rakuten points, or EF 70-200mm f/2.8L IS III USM lens for $1,679 after $419 Rakuten points and more. All these items are with Canon USA warranty. Author adminPosted on October 18, 2018 Categories Canon EOS 5D Mark IV, Canon EOS R Deals, Canon EOS-1D X Mark II, Canon Full Frame Mirrorless Camera, Canon LensesTags Canon EF 70-200mm f/2.8L IS III USM Lens, RakutenLeave a comment on End Tonight – EOS R Body for $1,839, w/ 24-105 for $2,719, 5D Mark IV for $2,479 and More After 20% Rakuten Points ! The Canon EOS 5D Mark IV is Canon’s latest full frame DSLR camera released in 2016. It is now $300 Off cheaper at this Black Friday & Cyber Monday 2018. Tony Northrup recently posted a video comparing the image quality of the new announced Canon EOS R (B&H/Amazon/Adorama/Focus Camera/WEX/ParkCamera) to Canon EOS 5D Mark IV, 6D Mark II, Sony a7 III and Sony a7R III.